This morning I will share a few round items before I head off to the office. I will start with one of the first round objects I took a picture of in Germany on this trip. When catching the train it is important to keep an eye on the clock. 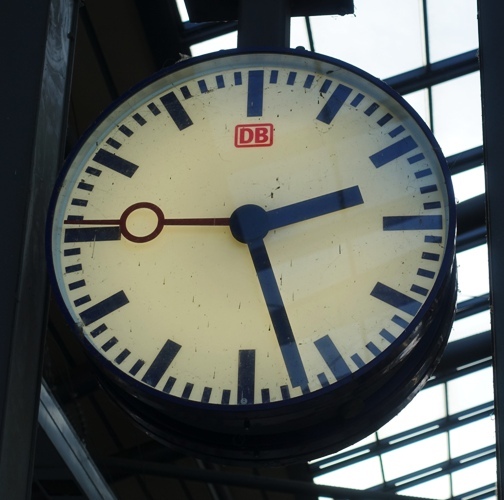 This picture was taken in the Frankfurt Main train station. 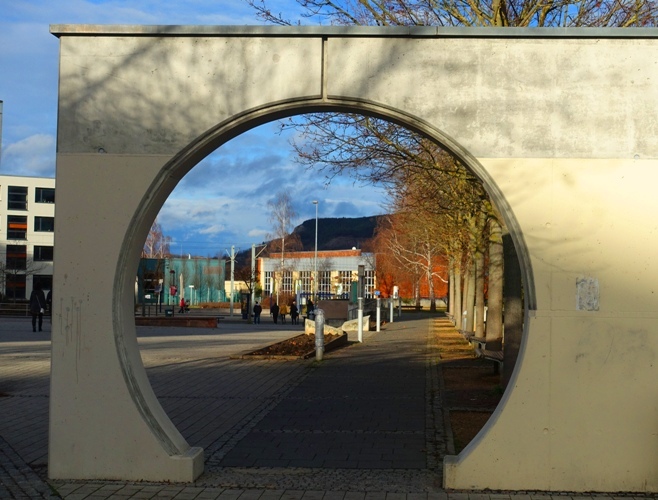 This round gateway has always intrigued me through the years. It is near the hotel where I stay in the Lobeda area of Jena and is also near where I catch the street train. At some time I need to pull together some of the pictures I have taken of it through the years and in different seasons. 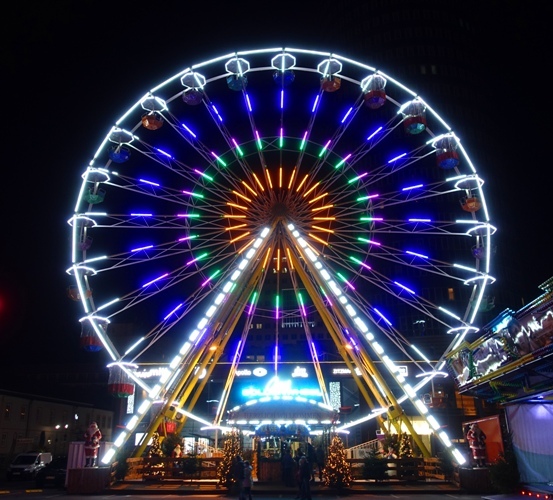 Along with the Christmas Market in Jena there is also a carnival. The carnival includes a large colorful Ferris Wheel. There is also a large Weihnachtspyramide or Christmas Pyramid in the carnival area. 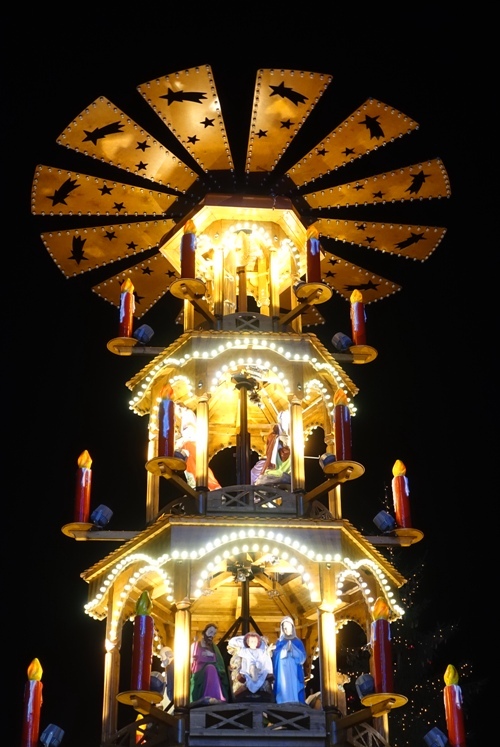 A Weihnachtspyramide is usually table sized and the rising heat generated from the candles makes the rotor on the top spin. In this case, there is a motor that drives the rotor. You can see the nativity scenes on the different levels of the pyramid. For a better idea of the size of this Weihnachtspyramide I will show it along with the Ferris wheel in the next picture. Here is the Weihnachtspyramide and Ferris wheel together, but we also have a round Christmas tree. Also, invisible except for the marquee on top, the large round tower in the center of Jena’s downtown. I hope you enjoyed this wandering roundabout post. 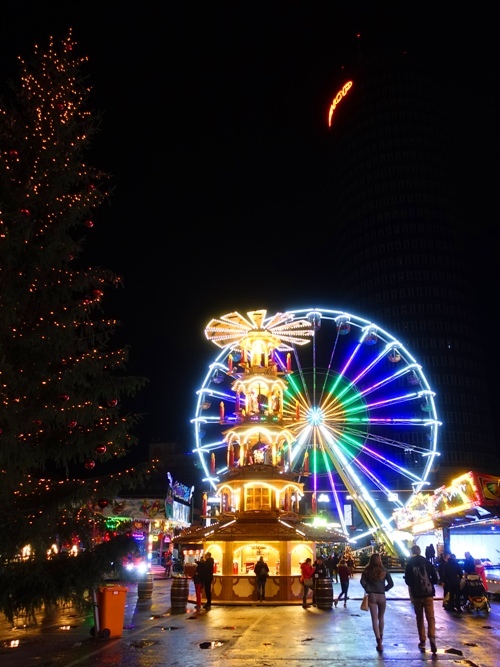 This entry was posted in Culture, Germany, Holidays, Travel and tagged Christmas, Christmas Pyramid, Clock, Ferris Wheel, jena germany, Round, Weihnachtspyramide. Bookmark the permalink.